Get away from it all� but keep eating well! When it comes time to head out on the trail, or to hit the road for a rural weekend at the cabin or lake house, there�s no reason to compromise on great food. 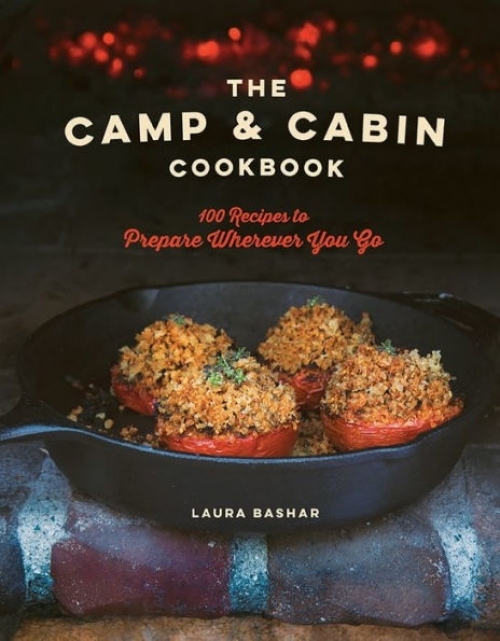 It�s easy to whip up delicious meals with the recipes provided in �The Camp & Cabin Cookbook� (The Countryman Press; $24.95/hardcover) by Laura Bashar. In addition to supply lists and prep work that can be done ahead of time, instructions provided include options for cooking both outdoors over a roaring fire or indoors near a cozy hearth. Recipes include: Hasselback Sweet Potatoes, Dutch Oven Lasagna, Carne Asada, Street Tacos, and even tasty desserts such as Peach and Blueberry Cobbler. �The Camp & Cabin Cookbook� is a feast for the eyes, with gorgeous photographs for every dish, with 100 recipes from breakfast to snacks to dinner, and even cocktails! In other words, these recipes are keepers, no matter where you choose to enjoy them. Don�t leave home without it! Laura Bashar is half-Persian and half-American and was raised eating gourmet meals that her working mother prepared. She quickly learned that the family meal was where stories were shared, memories were made, and, of course, good food was enjoyed. Laura brought her culinary enthusiasm to her own family�s meals and began to write it all on her blog, �Family Spice,� in 2008. Laura used her graphic design background and life-long love of photography to document delicious meals that appeal to all of the senses. Laura enjoys getting creative in the kitchen, combining fresh ingredients, contrasting flavors, exotic spices and multiple cooking techniques from all over the world. Laura�s recipes and photographs have been featured in multiple websites and publications including The Huffington Post, BuzzFeed, Parade, and Today. Laura works regularly with brands to photograph and develop recipes. In 2014, Laura photographed, designed and co-authored the cookbook, �Cooking Techniques and Recipes with Olive Oil.� As an ebook, it won a gold medal from Dan Poynter�s 2013 Global Ebook Award. Demand was so strong for the ebook, that Laura and her partner expanded it and produced a beautiful hardback cookbook. As a certified olive oil taster, Laura often travels and holding cooking demos to demystify extra virgin olive oil. Laura is also a member of the San Diego Chapter of Les Dammes d�Escoffier and International Association of Culinary Professionals (IACP).